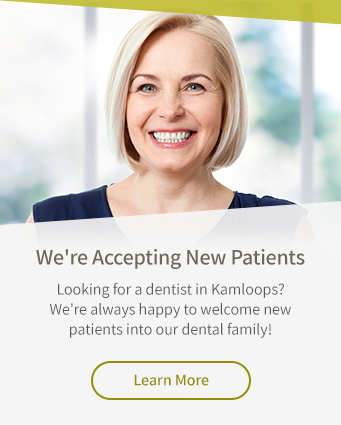 At Cedar Dental Centre in Kamloops, we offer dental implants as a fixed alternative to removable partial or complete dentures for people with missing teeth. Dental implants are tiny titanium rods that are surgically placed into the upper or lower jaw bone to replace a missing tooth root. They are then capped with a dental crown to create a natural looking, sturdy artificial tooth. It is essential to replace missing teeth because a gap can cause many dental health problems. The teeth surrounding the gap may begin to shift out of their proper positions, causing misalignment and bite issues. In addition, when a tooth is missing, the jaw bone around the area will begin to deteriorate over time. This can result in a condition called facial collapse. Having a missing tooth or teeth can also negatively impact your ability to bite into foods, chew, and speak.